Since 1998, VTS has sent faculty and students on parish and teaching internships to Tanzania. Past participants include the Rev. Jacques Hadler, Judy Fentress- Williams, Dr. John Yieh, Allison Sandlin Liles ‘06, Caron Gwynn ’06, Leslie Nuñez Steffensen ’06, John Newton ’08, Cynthia Park ’08, Josiah Rengers ’10, and Meredith Holt ’10. 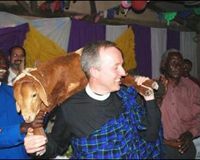 In 2009, VTS was awarded a Partners in Global Mission grant from Trinity Wall Street to bring over four MTC students over two January terms to experience the VTS cultural context and outreach in the Episcopal Church. In 2010, Stephen Mnubi, Daniel Fweda, Venuce Mazengo, and Daudi Manase were the first visitors. Virginia Seminary’s relationship with Tanzania also extends to the village of Mgunga, where VTS has adopted 50 children through a diocesan project called Carpenter’s Kids. Through the program, VTS will supply the children with school uniforms and daily lunch for the next five years. Following a visit to see the Carpenter’s Kids, Markham was made Honorary Chief of Mgunga and was offered several gifts, including a sheep. Can Dialogue heal relations in the Anglican Communion?